If it's Thursday it must be time for a new study, so here's one from a couple of university professors who say that playing violent videogames renders people indifferent to the pain and suffering of their fellow human beings. Conducted by Professor Brad Bushman of the University of Michigan and Professor Craig Anderson of Iowa State University, the study had 320 students play a videogame, either violent or non-violent, for roughly 20 minutes, after which they heard sounds of a staged fight that culminated with one of the combatants "groaning in pain" after ostensibly suffering a sprained ankle. "People who had played a violent game took significantly longer to help the victim than those who played a nonviolent game - 73 seconds compared to 16 seconds," the professors noted. "People who had played a violent game were also less likely to notice and report the fight. And if they did report it, they judged it to be less serious than did those who had played a nonviolent game." Similar results were reported in a separate study of people who watched a violent movie, who took a reported 26 percent longer to respond to a staged emergency outside the movie theater than subjects who had watched a non-violent movie. 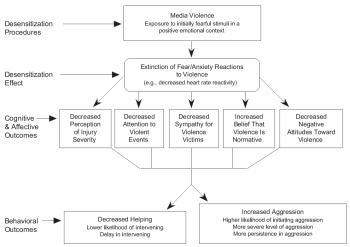 "The present studies clearly demonstrate that violent media exposure can reduce helping behavior in precisely the way predicted by major models of helping and desensitization theory," the study concluded. "People exposed to media violence become 'comfortably numb' to the pain and suffering of others and are consequently less helpful." GamePolitics notes that both Bushman and Anderson have previously undertaken research into videogames that resulted in similarly negative findings; in November of 2008, Anderson published a study of children in the U.S. and Japan which concluded that playing violent videogames left them more prone to violent behavior. Results of this latest research did not mention whether similar effects could be measured in someone who had just spent a half-hour watching Fox News.